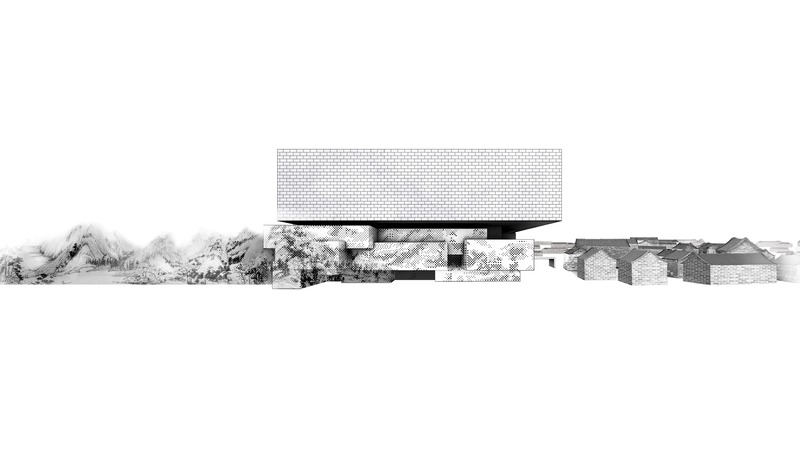 A building for the display and exchange of art, carefully embedded within the small scaled historical fabric while resonating with the surrounding contemporary context. An auction house is a hybrid between museum, gallery, market – culture and trading. An auction house links past, present, and future. Ultimately, an auction house celebrates and passes on awareness of history and traditions; it provides a stage for cultural values: respect and responsibility, valuation and prediction, beauty and meaning. An auction house attracts and gathers people and auctions are social events for the appreciation of art and culture. 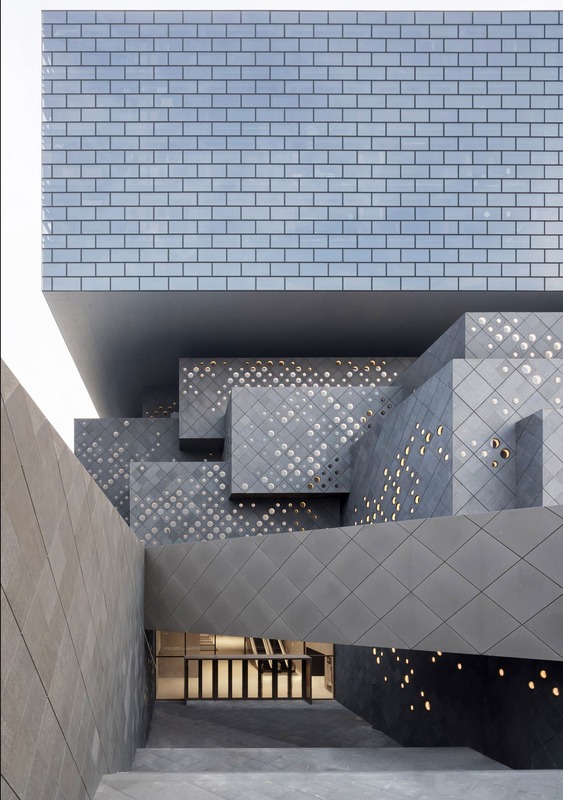 The building acts as a social catalyst for cultural exchange and imagines a home for the arts in a broader sense – a home for its makers (the artists) and its keepers (the collectors). 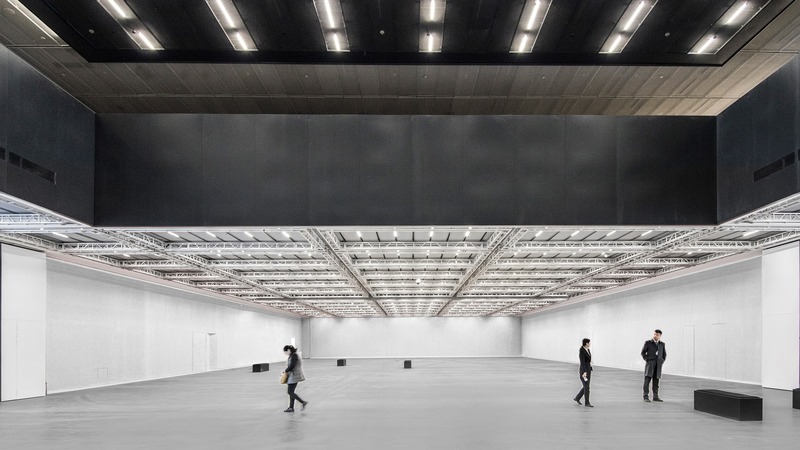 At the center of the building, a 1,700 square meter column-free exhibition space allows for maximum flexibility and versatility, while expansive exhibition areas on the second floor further extend the museum. Two large auction/exhibition halls in the basement provide a more specific and formal setting, completing the typological variety of spaces. 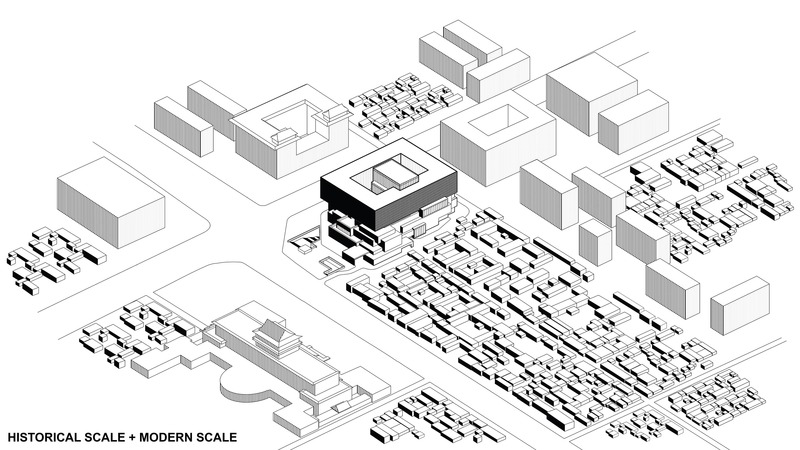 The surrounding matrix of smaller, interconnected rooms of the architectural pixels accommodates support functions and liberates the building’s central halls from secondary obligations. The building is, at its core, a machine for exhibitions and events. 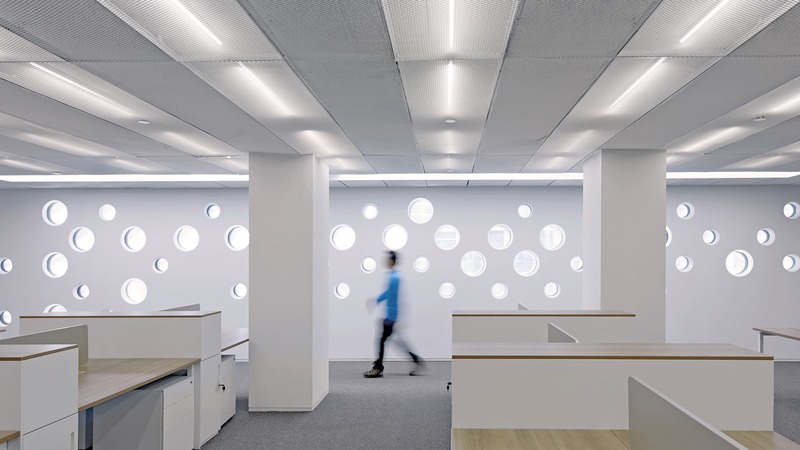 The two main column-free spaces are stacked in the center of its footprint and enable a multitude of uses – simple, yet versatile ceiling and floor mechanisms provide easy adaptability. These two spaces create a sectional courtyard within the building at the scale of a hangar – a space so large that virtually anything can happen. 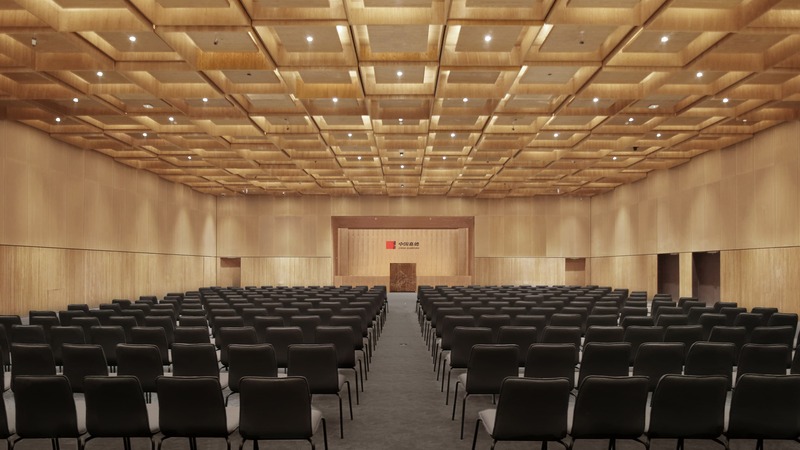 They stage and accommodate auctions/exhibitions throughout the seasonal auction calendar, but for most of the year expand the cultural programming into special exhibitions, symposiums, and events of diverse nature – a public/private museum with a cultural and educational mission. Surrounding the central halls is an extended realm of smaller gallery spaces and supplementary support functions. The project navigates between the neutral and the specific, combining aspects of both by providing large scale spaces that are flexible and convertible; along with a collection of interconnected more intimate spaces for specific functions of distinct character. Together, the multiple programs and circulation through the building give insight and access to the process of art appreciation, education, and the study and acquisition of artifacts to a variety of users – from Guardian’s own staff and experts, to novices, collector syndicates, art consultants, collectors, artists, and academics. 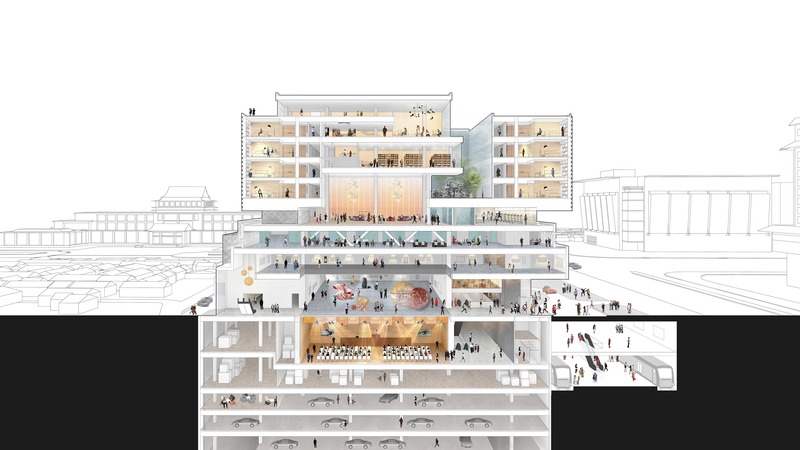 The Guardian Art Center represents a new hybrid concept for a cultural institution that transcends the traditional definitions of a contemporary art space. Merging the display and presentation of art in its museum spaces with the multifunctional capacities of its exhibition and auction rooms allows virtually any type of usage and event to take place. The seamless integration of several restaurants and a 120-room hotel in the floating ring of the building with views to the Forbidden City creates an encompassing lifestyle concept centered on the experience of art and culture. 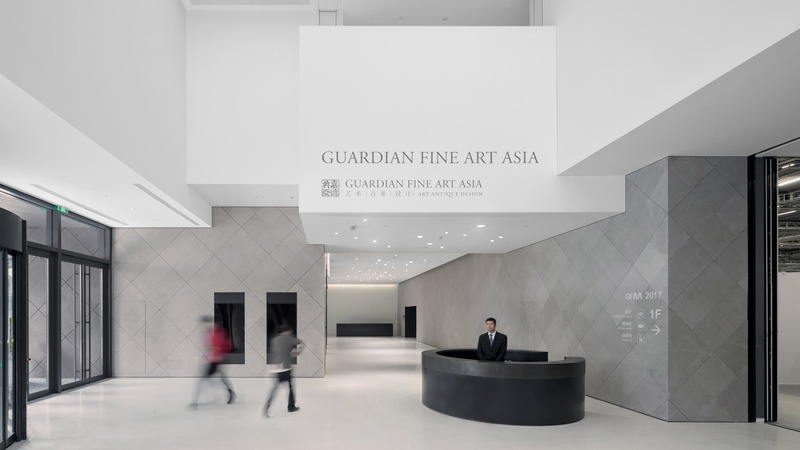 Through the addition of educational facilities in its central ‘club tower’ and art conservation departments in its basements, the Guardian Art Center further manifests its position as the world’s first custom-designed auction house headquarters and a new hybrid art space. Located in close proximity to the Forbidden City on No. 1 Wangfujing Street, at the intersection with Wusi Avenue, the new headquarters for China’s oldest art auction house is symbolically located at the crossroads between commerce (Wangfujing) and culture (Wusi Avenue). 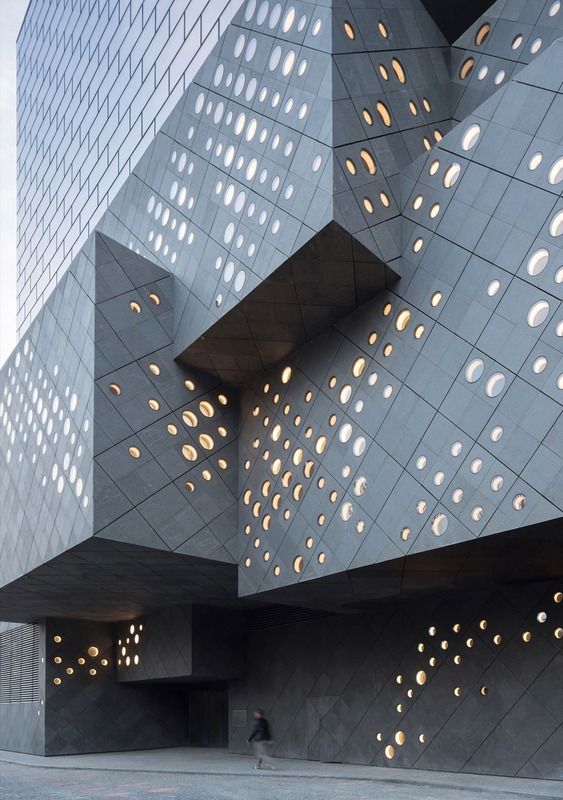 Embedded in the historic fabric of central Beijing, the building forms a new hybrid institution between museum, event space, and cultural lifestyle center. How to resolve the everlasting tension between the old and the new, the historic and the modern, the contrast of architectural scales and languages? This project is centered on the question of how to synthesize the presence and values of the past with the potentials and realities of the contemporary. 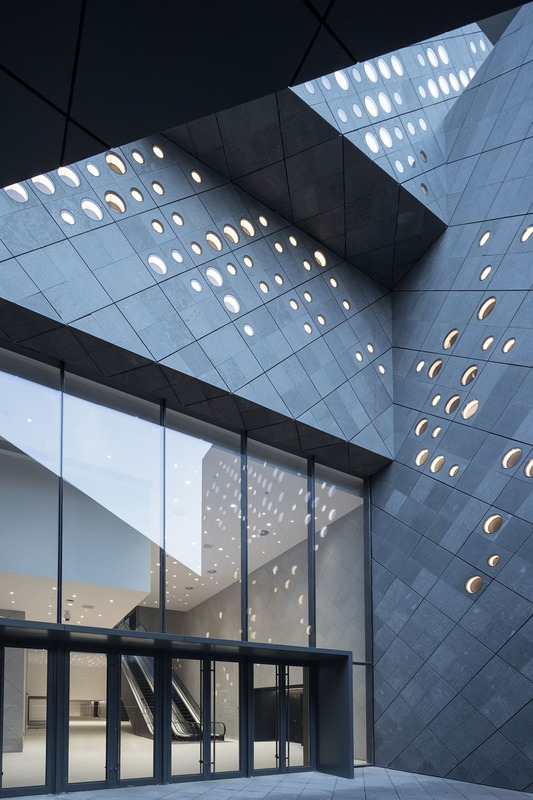 The design carefully inscribes the building into its surrounding context, in a sensitive architectural interpretation that fuses history and tradition with a contemporary vision for the future of a cultural art space. 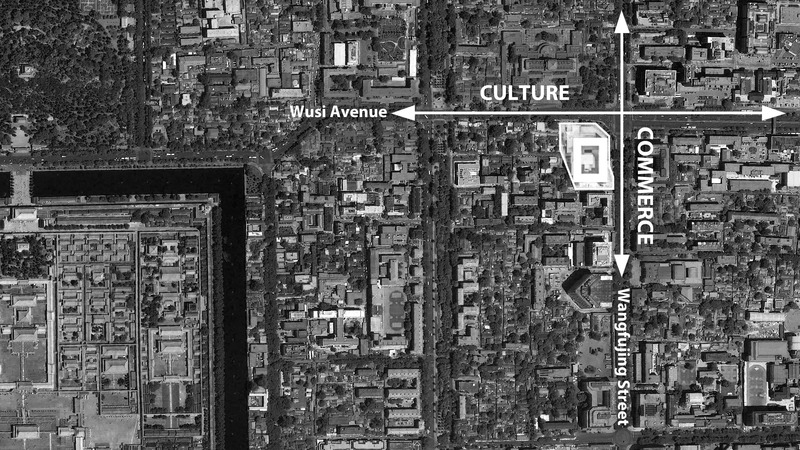 The ‘pixelated’ volumes of the lower portion of the building subtly refer to the adjacent historic urban fabric, echoing the grain, color and intricate scale of Beijing’s hutongs, building upon its surroundings and ‘layering’ into its base the sediments of history. 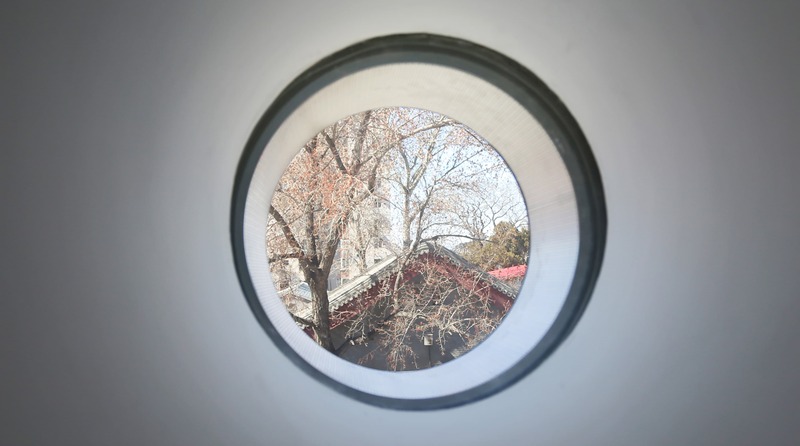 The upper portion of the building responds to the larger scale of the surrounding contemporary city in the form of a floating ‘ring’ that creates an inner courtyard to the building and further resonates with the prevalent typology of the courtyard houses in Beijing. 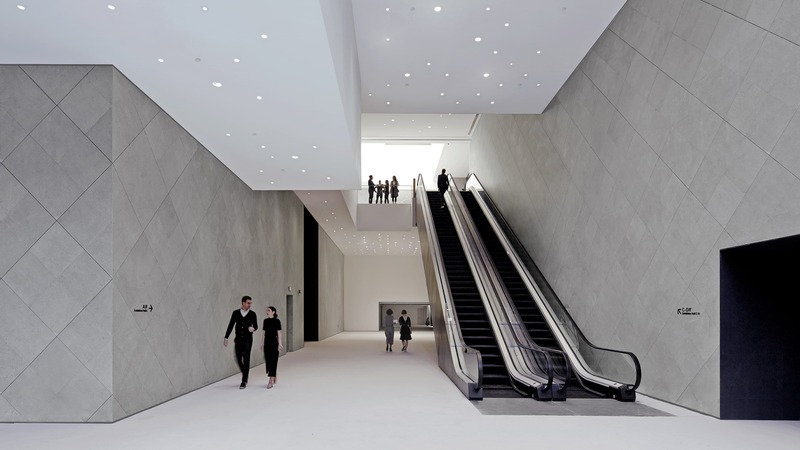 By combining both the intimate and the monumental, and creating a diverse collection of spaces within this structure, the massing integrates itself into the sensitive historical and cultural environment and resonates with Beijing’s strength and imposing presence through an explicitly understated monumentality. 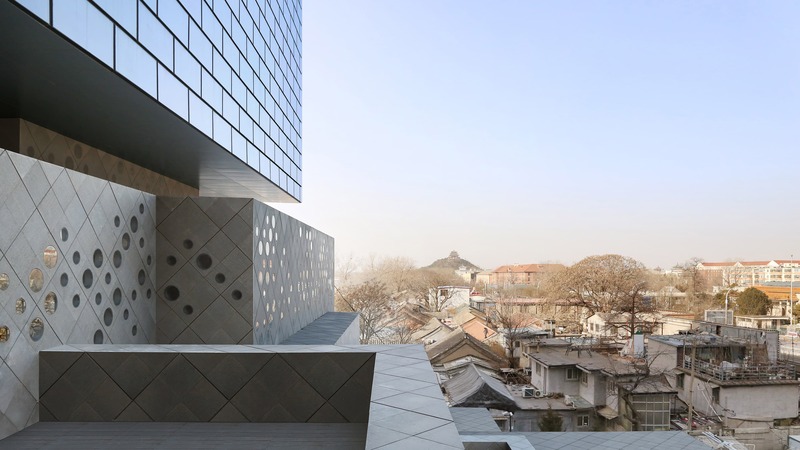 The building’s facades take on a specific role in its cultural expression and Chinese integration: Materiality, color, and texture establish abstract and subtle correspondence with Chinese symbols and meaning. The upper ring of the hotel is made of floating, over-sized glass bricks, resonating with the textures of the adjacent hutongs and courtyard houses. In contrast to the imperial motives of the nearby Forbidden City, the brick represents civil society and values – a humble and non-elitist symbol in Chinese culture. 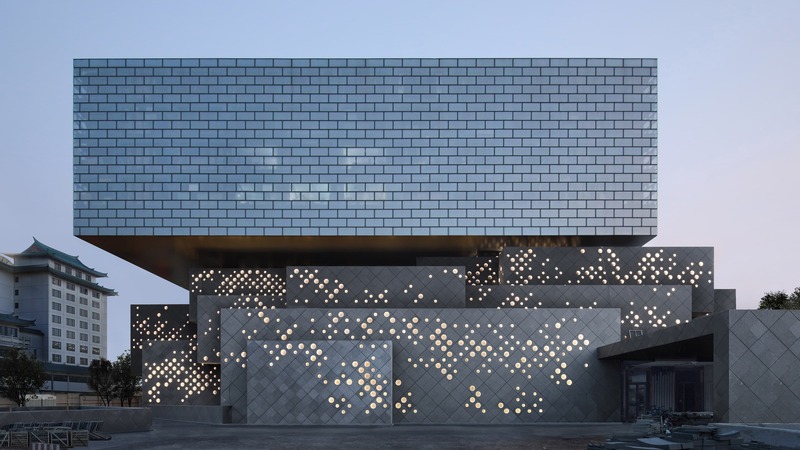 The grey stone-like pixels of the lower portion of the building are perforated by several thousand circular openings – generated by projecting one of China’s most important historic landscape paintings, Dwelling in the Fuchun Mountains, onto its facades and thereby creating a subtle light filter through an abstracted landscape silhouette. 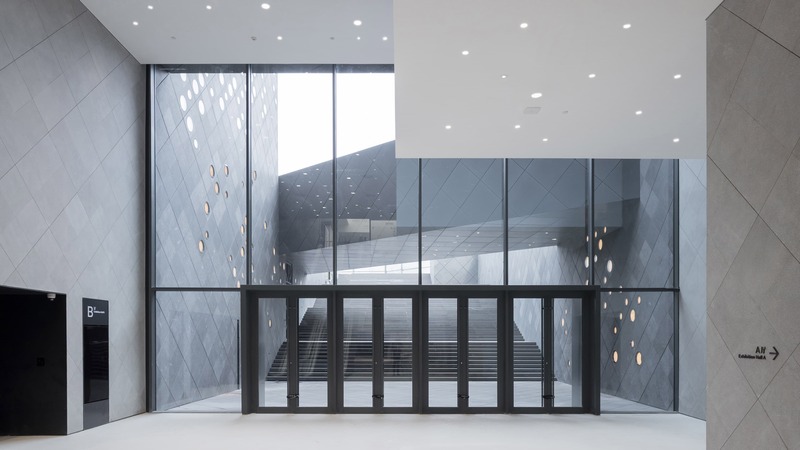 The Guardian Art Center creates a new civic destination for arts and culture that fosters the exchange, study, and appreciation of cultural artifacts and activities – a vehicle for cultural dissemination and collection, a new center for art, in the center of Beijing.